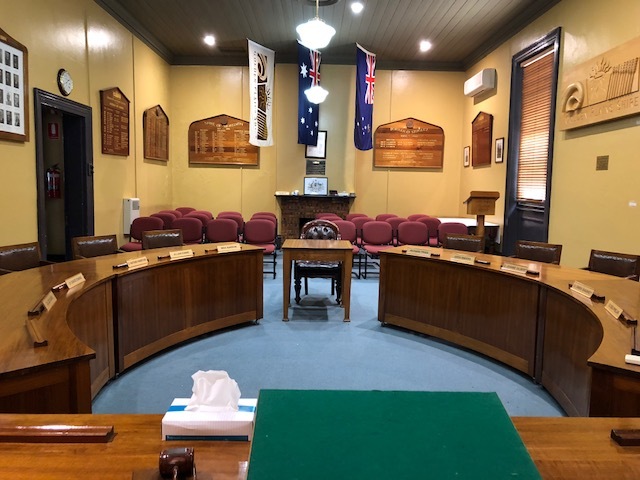 Our January 2019 Council Meeting was held in Bannockburn with all Councillors and about 20 community members in attendance. The meeting opened with a presentation of an Australian Honours (Medals) Board from Peter Doak OAM, on behalf of the Order of Australia Association (Barwon Regional Group Committee) to the Golden Plains Shire Council. Council heard from two objectors and the applicant about the nine-lot residential subdivision planning application for Smith Road, Lethbridge. The lots are proposed to range from 4500-6300m2 with a common driveway to five of the lots from Smith Road, and access to the other four lots from Steddy Road. Council made the decision to defer consideration of approval to the February 2019 Council meeting. The proposal for a free range layer farm at 133 Booley Road, Gheringhap, included shedding and use of surrounding paddocks for up to 135,000 free range chooks. Council supported the officer recommendation to approve the application, but added a condition to provide vermin-proof fencing around the free range area. This planning application proposed the keeping and training of greyhound racing dogs at 150 Quarry Road, Lethbridge. The advising Council officer raised concern about the proposal’s scale of operation and recommended the refusal of the application. Council agreed with the officer recommendation and the permit was refused. In the November 2018 Ordinary Meeting, Council deferred a decision on the Inverleigh Streetscape Master Plan to January, to allow for more community consultation on masterplan which includes the implantation of one-way traffic flow on sides streets. The draft plan will be presented to the Inverleigh community at a meeting on Monday 25 February. Therefore, Council agreed to defer its decision on the Inverleigh Streetscape Draft Master Plan to the May 2019 Council meeting. In 2011, Council adopted the Environment Strategy 2011-2016. The strategy addressed a range of environmental focuses and included a robust community consultation process. A new Environment Strategy, encompassing the period 2019-2027, was developed in 2018 after a comprehensive consultation process. This ambitious strategy has been deliberately designed to align strongly to the Council Plan and reflect the capabilities of a rural Shire with settlements dispersed throughout the municipality and limited resources. The draft Environment Strategy 2019-2027 was on public display from September 2018 for four weeks, with four submissions received. Council has adopted the plan. Based on the success of Golden Plains Shire Councillor Conversation Posts in 2018, Council has committed to attend and actively engage with the community at a minimum of six conversation posts across the Shire throughout 2019. This is in line with the Local Government Act Review, which sets expectations for all councils to adopt and maintain a community engagement policy. The City of Greater Geelong (COGG) recently established a Rural and Peri Urban Advisory (RAPUAC) Committee, which has suggested a scoping study for a multipurpose small scale livestock and information exchange. A motion to make a $15,000 contribution to the study was lost. Council then considered the officer recommendation not to support the financial contribution, which was supported. Council approved GO Traffic Pty Ltd as the preferred supplier the GPS-RFT 15/2018 contract, for the Provision of Traffic Management Services for the tendered schedule of rates for the initial contract term of three years with a two year extension option. The meeting ended at 9.44pm. Find the minutes of the meeting here.